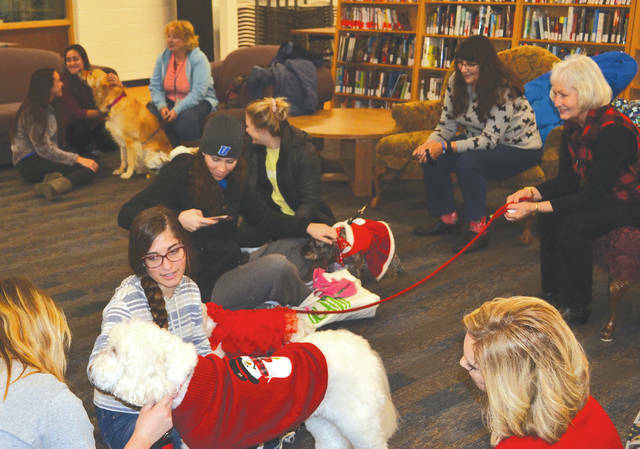 Five dogs and their owners from the Alliance of Therapy Dogs visited Urbana University students in the library on Tuesday to help give them some stress relief during finals week. Freshmen Mikayla Kesel and Erin Gardner got acquainted with Sadie when her owner, Rosemary Musser, visited the Urbana University library with the Alliance of Therapy Dogs on Tuesday. Sadie and her owner, Rosemary Musser, were a big hit with Urbana University students when the Alliance of Therapy Dogs visited the Urbana University library on Tuesday.